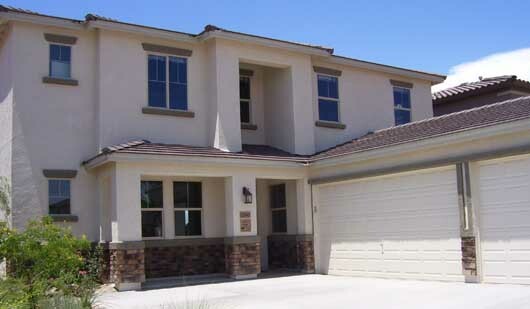 Centex Homes builds many new homes in Arizona. 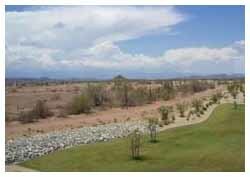 We are focusing here on the Preserve at Cibola Vista development. There are seven different floor plans here. There are a few interesting design features I would like to point out with these new homes in Arizona. Those of us looking to do our part for the environment will be glad to know that these homes are part of the Arizona Public Service (APS) Energy Star Homes® Program. This is a program backed by the federal government that helps protect the environment through energy efficiency. Whether you are concerned about the environment or not, this means lower utility bills. Everyone likes that. Click here to view the features of the APS Energy Star Homes® Program. This will open a new window taking you to the APS website. (Take special note of the average monthly utility bill estimates - 3,500 square foot home with a $160 monthly utility bill... nice!) I have personally lived in two different new homes in Arizona and I have never had electric bills that low, and our first home was only 1,500 square feet. Located near 91st Ave and Jomax Road. Only 10 miles from Lake Pleasant. There are approximately 131 lots in the development. The prices range from about $240,000s to the mid $320,000s. The homes range in size from 2,052 - 3,571 square feet. The Preserve at Cibola Vista is built by Centex Homes. Families with school age children living at the Preserve at Cibola Vista are in the Deer Valley Unified School District. Below are some of the highlights, but I also wanted to point out that Centex also reuse some building materials, re-plant plant life disturbed during the building process, xeriscaping (almost a necessity for new homes in Arizona), and Centex also uses locally installed and produced materials whenever possible. There are many more standard features, but these were the ones that stood out in my mind as being different than what other new home builders in the area are offering. You can click through the links to view pictures of the models or drawings of the floor plans of each home. At this time there are no interactive floor plans for these models. The Sienna - is a single story with 3 bedrooms, and 2 baths, with a 3-car tandem garage. You could convert the living room into a den and also add a 4th bedroom in place of the 3rd car garage. It is 2,052 square feet and the starting price is just a bit under $245,000. Centex does not have a model of this home. The links take you to the floor plan. The Tierra is a great little Arizona new home. It is a single story home with four bedrooms, two bathrooms, and a split three car garage. The most interesting option about this home is that you can convert the third car garage into a casita which adds a fifth bedroom to this home. You could also convert a bedroom into a master retreat. The home is 2,206 square feet and starts just under $255,000. The Lariat - is a single-story home with 2 bathrooms, and can either be four bedrooms, three bedrooms with a den, or a master retreat. There is also a three car garage. The home is 2,339 square feet and starts at just over $260,000. Centex does not have a model of this home. The links take you to the floor plan. The Trinity is a two-story home. There are four bedrooms, all upstairs, and two and a half bathrooms. You have the option of converting one of the bedrooms into a loft instead. The home is 2,672 square feet and starts at just over $280,000. Centex Homes does not have a model of this home so these links take you to a drawing of the first floor and the second floor. The Pecos is an Arizona new home build. It is a two-story home with four bedrooms and three and a half bathrooms with a three car garage. You have the option of converting one bedroom to a den, or converting the game room into a fifth bedroom. The home is 2,991 square feet and starts at right around $295,000. The Summit is a two story home. There are four bedrooms, three full bathrooms, and a three car garage. There are too many options to list here. Just take a look at the floor plan, but know that you can have up to six bedrooms and a casita. The home is 3,243 square feet and starts at just over $300,000. Centex Homes does not have a model of this home so these links take you to a drawing of the first floor and the second floor. The Palacio is the largest home at this new home development. It is a two story home. There are five bedrooms, three full bathrooms, and a three car garage. Again there are too many options to list here. Please view the floor plans to see what is possible with this home. The Palacio is 3,571 square feet and starts at just over $315,000. Centex Homes does not have a model of this home so these links take you to a drawing of the first floor and the second floor. There are only three models for you to view at this new home community, but Centex builds seven different homes at this subdivision. I wanted to have photos of the homes here so I searched for other new homes in Arizona that Centex built to provide you with the exterior photos of each model. With all the different new homes in Arizona it is tough to go look at all your options, but if you are looking for energy efficient "green" homes then the Preserve at Cibola Vista may be exactly what you are looking for. Out of all of the new homes in Arizona, Centex seems to be the most committed to building energy efficient homes. 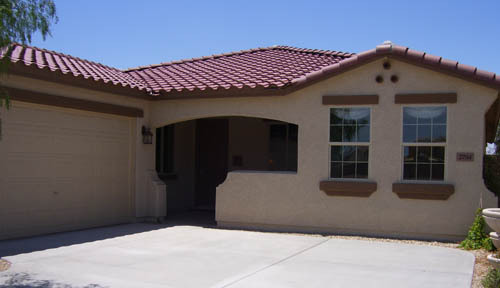 If you want to see other new homes in Arizona visit our new homes section. I strive to have the most extensive Peoria AZ new homes section on the web. If you would like to continue looking at other new homes in Arizona then visit our Peoria Arizona new homes for sale section. If you are ready to go visit this community please give me a call. If you don't reach me, I will call you back very quickly.